Since 1952, Teesing is an international supplier of fittings, valves, tubing, systems and assemblies for Industrial applications, Submicron Technology and Alternative Energy in Pneumatic, hydraulics, instrumentation and transport of media. With offices in the Netherlands (ISO certified Headquarter in Rijswijk), USA (New Jersey) China (Beijing), and Taiwan, we are globally active in several high niche markets, such as medical/pharmaceutical, water treatment, automotive, railway, alternative fuels, and the semiconductor. We have the skills and knowledge to design, build and test virtually any product or assemby for connectivity solutions. However, what makes Teesing Engineering unique, is combining existing products with custom solutions to create the assembly in the most efficient and cost effective manner. We are not limited to a certain brand or product range. Before starting production, Teesing’s engineers develop the assemblies in 3D design in CAD to ensure the right specifications. After cleaning an assembly or product for our clients in the semiconductor and mechatronics industry, we can store this in a number of leanlifts that have been conditioned and are over pressured. This system ensures that cross contamination and movement of particles are kept to a minimum. The products are stored in a safe and clean manner. We designed a Liquid Filter Unit that filters coolant before it enters the heat exchangers in radar equipment. 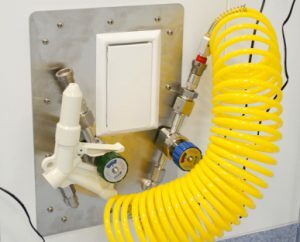 We used an industrial commercially available filter and built a frame work around it with required valves and connections to make it suitable for the demanding environment on navy vessels. The coolant liquid is filtered down to 1 μm contamination. Commercially available industrial components are not necessarily suitable for use in demanding marine applications, while the price and specification are interesting. By creating a frame around it, the filter can be used in this environment, protecting it from shocks and by even facilitating a redundancy function for some double filter versions. The end result is a plug-and-play product, assembled and pressure tested. 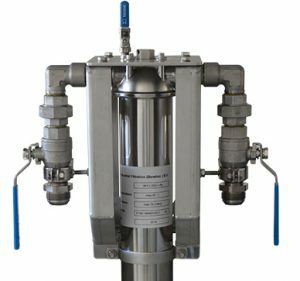 By combining the industrial filter with a frame and connectors, a competitively priced product is created, suitable for the job.